SPOKANE, Wash. — The anti-vaccine movement has come for pets. 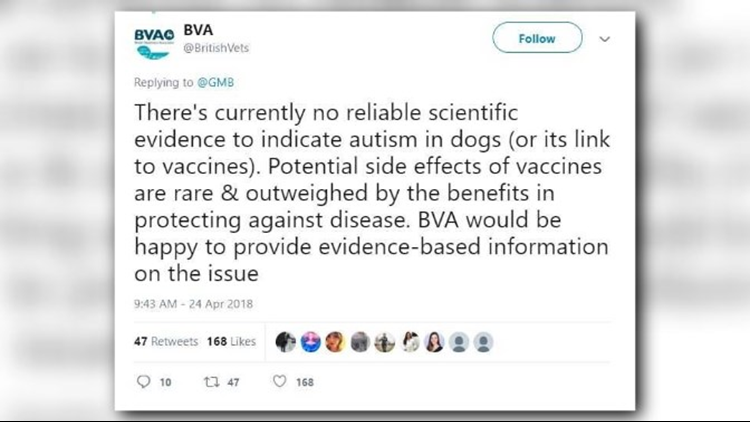 In fact, the spreading fear of side effects from pet vaccines led the British Veterinary Association to issue a statement that dogs cannot develop autism from them. Back here in the states, Doctor Raelynn Farnsworth with the WSU College of Veterinary Medicine echoes this for all pets. "I do hear people that come into the office and say, 'Well, I don't believe in vaccines or I think vaccines cause problems,'" Dr. Farnsworth said. "We do hear the autism claim in humans and so what does it do to their pets. There are studies out there that we are seeing a decline in animal visits to the veterinarians. Mostly that's based on people's perception that their pet doesn't like the vet, so they don't take them. " She said it's important to vaccinate your pets for their well-being, and the well-being of all pets. "If enough animals are vaccinated it puts animals that are at risk for medical reasons or age reasons can't get vaccinated, they're less likely to get sick from the diseases if the general population is vaccinated," Dr. Farnsworth said. Not only that, but she said the risk of these diseases, and treatment for them, outweigh any potential side effects. "Most of the diseases we vaccinate against we do so because they're pretty detrimental to the pet," Dr. Farnsworth said. "Like with the parvovirus, they can die if left untreated and pets did die before the vaccine was available in large numbers." So what vaccines does your pet need and how often should they get them? Dr. Farnsworth said there are "core vaccines" recommended for all pets. But your vet will make recommendations based on your pet's health and lifestyle. In general, dogs or cats should be vaccinated after they're 12 weeks old, which is good for one year. Some vets will do a rabies vaccine that's good for three years. This is given to your pet when once they're at least 15 months old. The size of your pet doesn't affect the vaccine dose. It's just one dose per animal.